Arkansas, Colorado, Florida, Idaho, Kansas, Kansas City (Missouri), Louisiana, New Mexico, northern Nevada, northern California, Oklahoma, Texas, and Utah. To find out more information about the kind of savings you can make as an Amazon Prime member, check out the website. 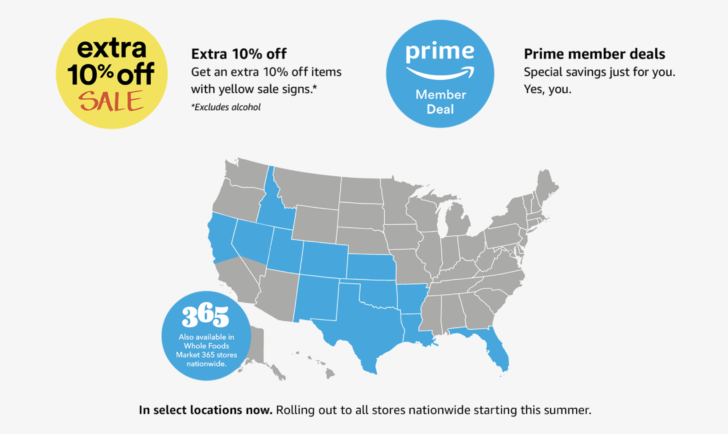 SEATTLE & AUSTIN, Texas--(BUSINESS WIRE)--(NASDAQ: AMZN)—Starting today, Prime member savings are expanding to an additional 121 Whole Foods Market stores across 12 states – including northern California, Colorado and Texas – plus all Whole Foods Market 365 stores nationwide. Prime members will receive an additional 10 percent off sale items, typically hundreds of products throughout the store, plus exclusive weekly deep discounts on select popular items. Visit amazon.com/primesavings for a map of areas where this benefit is available and to learn more.